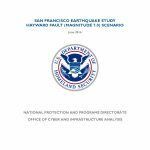 The results of this analysis show a strong earthquake will likely cause significant damage to critical infrastructure in the area affecting 547 dams or water control structures, render approximately 300 roadway segments unusable, and cause damage to 172 water and wastewater treatment systems. The scenario earthquake will likely cause damage to 154 dams in the area. Seven of the dams will likely experience Extensive or Complete damage. The Ward Creek Dam, which is used for flood control, is likely to incur Complete damage. Extensive damage to the James H. Turner Dam poses the greatest risk to downstream population. The earthquake will cause damages to many road segments, bridges, and tunnels in the area. As a result, travel times on these roadways and others will increase significantly. Multiple areas on freeways such as I–680, I–880, and I–580 will have the highest above normal traffic volumes. Several bridges on these freeways will also likely incur Extensive damage. Tunnels in the area will likely have less damage with bores in the Caldecott Tunnel on State Route 24 experiencing only Moderate damage. 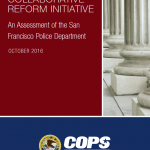 As a result of an extensive independent assessment of the San Francisco Police Department’s (SFPD) activities and operations, the U.S. Department of Justice (DOJ) Office of Community Oriented Policing Services (COPS Office) presents findings and recommendations on how to address the agency’s needs proactively in a long-term manner to improve trust between the SFPD and the communities it serves. 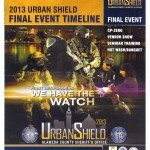 Official timeline, event guide, vendor list and directory for the 2013 Urban Shield training exercise organized by the Alameda County Sheriff’s Office. 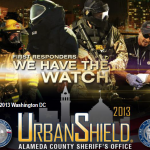 Urban Shield is a continuous, 48-hour Full Scale Multi-Disciplinary Homeland Security/Disaster Preparedness Exercise hosted by the Alameda County Sheriff’s Office, with the support of the Bay Area Urban Area Security Initiative (UASI), and more than 150 local, state, federal, international and private sector partners. A request for participants (RFP) issued by the San Francisco Public Utilities Commission on June 8, 2012. The RFP concerns the construction of a wireless control and communications network for managing the city’s planned upgrade to dimmable LED streetlights. The RFP states that future uses for the secure wireless network may include street surveillance, gunshot monitoring, public information broadcasts, electric meter reading and pollution monitoring.